Lea was extremely helpful. she was willing to talk to us after hours. We are impressed at the cleanliness and great upkeep of the entire property. Very pleased with the service. Everyone is always so friendly here & lots of security, Love it here! You can't go wrong storing your good at this RV and self storage. I have been with Premier RV located at 8030N.El Mirage for many years now. No complaints at all. They are very personable and helpful. I am extremely pleased!!! I have been using Premier RV & Self Storage since 2002 on and off as I have been having RV's. This is the best I have found on the West side. Clean, well maintained, and very well managed. Ronda and her staff will do anything to help if the need comes your way. Look no further than Premier and know your RV is safe with them. I will stay until I sell out. great managers to run this site. They are always accommodating. never had a complaint. i love it here. Lots of laughs. thanks. I have only been here a few months. The office staff is nice. Bathroom are always very clean. Great wide isles. Great place to have our Rv detailed for our next trips. I give premier 2 thumbs up. I Referred a friend to store their boat at Premier and they have nothing but the BEST to say about this place! I went with him the other day to get the boat and it was SO clean and inviting! Looks like an amazing place to store with!! Rhonda was very very very helpful and kind. We now have been at this locations without issue for over a year. We feel very lucky to have found Premier RV & Self Storage. Rhonda was exceptionally helpful in getting us into just the right spaces for us. Every time we have gone there, the place is well maintained and we always get a ready smile in the office. We have recommended this place to others based on the service and site. The staff are soooo nice. Always doing what ever they can to help us out. We store our RV there and we feel very happy to come in and check on our motor home, and it is so secure. We would definitely recommend this place to rv people. storage for 13 years and we still love it!! It is clean, secure, roomy and affordable. Yes they have gone up on their prices, but who doesn't. We live 10 mile from Premier and we feel SOOO comfortable and secure that we know our "pride and joy " is ok. WE will stay with these guys till they kick us out. We pay the fee with out hesitation. We have recommended Premier to our friends too. We have 3 friends that store their ridges there too. I have stored my motor home at Premier RV for more than 10 years . The staff has always been helpful, professional, and caring. The property is kept neat and clean. I really appreciate the monthly newsletters, especially the information about road construction around the property. Excellent storage facility! We store our motor home at this facility and Rhonda is always pleasant and meets our request quickly. The roads around the facility are undergoing construction and we are pleased with the regular notifications of activity and access. Rhonda and her crew stay on top of the RV storage areas and keep customers apprised of construction closures/reduced access. Can't say enough about Rhonda and staff. Always helpful, friendly etc. etc. Good value for storing my RV in covered facility. "Above and beyond..." Friendly, efficient front office. Paperwork a bit cumbersome. I store a boat. Staff is very willing to help with problems/solutions as they arise. Always a pleasure, Rhonda brings the A in Awesome customer service. Have been here on several occasions to store my Rv. Have never been dis­satisfied. Love the site. Its busy but never had any problems. The Best Customer Service ewe have ever had! The Management Team, Rhonda, has been very helpful whenever we've had any problems with our RV. Excellent Customer Service, love the news letters too! I appreciate the help the staff has given whenever I have an issue with my motorhome. They have gone out of their way to assist me. We moved to Phoenix in 2011, and in short order we realized that because there is such a broad customer base, many companies have zero customer service ­ if a customer is unhappy, they don't seem to care, apparently content with getting new clients rather than happy current ones. Premier RV is one of less than a handful of companies we've dealt with that is the exception to the poor customer service. They were always beyond friendly and accommodating over the three­ plus years (almost 4) we rented with them on the several occasions we needed something outside our normal tenancy. When we need staorage again, Premier Storage is where we'll come. Premier RV & Self Storage is a top notch CAMSM property, always stepping up to the plate and hitting home runs. I hope you win, every kid should have an opportunity to attend a baseball game. Good Luck!!!!! Would recommend to anyone! Best facility in the valley! Management and facility are both terrific! Wouldn't store anywhere else! Love paved, covered parking and all the extras such as free compressed air, dump station, etc. Very secure and great access hours. Great facility. Rhonda goes above and beyond! 2nd time visiting storage and still very happy. service with a smile. high scores. would definitely rent again. Rhonda has been great to work with. Very friendly,knowledgeable and accommodating. I have been using storage most of my adult life & premier has by far, provided a superior feeling of safety, confidence & integrity with Rhonda running the show. She's awesome + she represents the company with unparalleled service. Thank you. Very outstanding storage facility. Will refer our friends. Great service and staff. Very professional and courteous. Enjoyed Storing with you. Will be back in the fall. I would certainly rent again. Rhonda was a pleasure to meet. Great service on all aspects. Nice facility. Convenient to have Rv washed and parked for us. What a pleasant young lady in the office. Connie is a pro with great customer service skills. Would highly recommend. have been extremely satisfied with the facility, customer service, and the security of this facility. I would recommend Premier RV and Storage to others. Rhonda Barba is an excellent manager! Clean, safe, friendly. We will refer our friends and we may rent again if needed. Nice office staff, clean, very professional. Rhonda greeted us with a welcoming feeling. paid a little more than we wanted to. Would recommend to my friends. Clean safe and secure. Nice staff. would rent again and refer friends. Give good rating on all service and amenities. staff is great from move in to move out. They have been nothing but helpful throughout the intire process. Need to hire more staff like them. Definitly made a great impression. I have rented for several years. I would rent again and refer a friend. Office nice are very pleasant people. The Staff is very friendly and knowledgeable. the best. I no longer need storage but would rent again I rate them a 10. Thank you. he price is good and the safety is good but the cleanliness staff and service are great. I would rent again. Rv Storage and Mini storage. Great Service provided. Everyone is very nice and friendly. Staff very helpful. Will always recommend. Friendly staff, always enjoyed visiting with them. great upkeep and location. Rhonda is very friendly and helpful. She is a major reason we will be back to premier this winter. The staff was very friendly & very helpful. Great place to store our stuff! fine, just fine, actually very fine, everything was fine, fine, fine. This facility is very nice and clean. There is a lot of room to drive in big vehicles and deload them. The office staff is very nice and knowledgeable. The price is best you will find on the west side of town. Office people were the best. safety, price and services are good. It's been a pleasure renting with you :) Thank You. Thank you, we are looking forward to being one of your customers! Everyone is so friendly, wish I had started with you 5 years ago! friendliness of staff, overall services. Nice to have a repair shop very convenient. maintenance and upkeep safety and security, Would rent again. Office Staff is the best. Rhonda is always helpful caring and very efficent. Also Connie is Good also!! I absolutely appreciate the security of being in your facility and If I come back next year, I would be a repeat customer. Thank you for everything! very friendly and considerate staff. Rhonda and Connie always greet with a smile and have gone above and beyond to accommodate our needs. Having Andy live on the premises for after hours assistance has been great for me to get out for my job on time on several occasions. Thanks for all the great customer service. We have had Rv storage since 2013 and just rented a mini storage. We are satisfied with the service we receive. we give 5 stars. Connie Is extremely nice and friendly. She's the best! I would definitely come here again. Great Service, upkeep. Okay prices. Nice Staff. convenient location. 5 out of 5 Stars, friendly service, cleanliness, convenience. Friendly staff, clean, great place. Excellent customer service. went to another facility and was not treated as nice as premier staff. Everything is very good. Nice to be here. Its been a pleasure to store my travel trailer at your facility. We give premier excellent on overall Service, friendliness maintenance and upkeep of facility. We have been here for 9 years. Service has been great. We would refer a friend anytime­ Everyone here is so nice. We appreciate all the help they have given us. Thank You for The Great customer Service. You are very funny people. You were quick with the paperwork, Easy to talk to and Very Friendly. I enjoyed coming in. 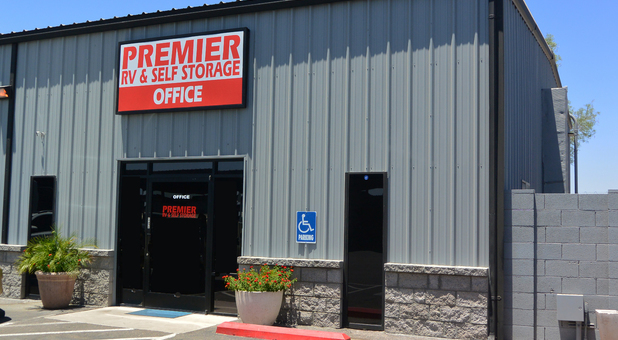 Through all the years I've done business with Premier Storage, I've always been satisfied. Rhonda just happens to be not only a great person, but also a fabulous director of all the business and there's a lot of business there at Premier Storage. Thank You Much. Excellent Overall friendliness, services, cleanness, safety. Very friendly and accommodating. I was referred by a friend. I would definitely rent again. The Manager, Rhonda asked me to write a review for her. what I feel is that the Premier Staff is amazing. Always standing with a smile and ready to answer questions. Provide a clean well organized property and spent extra time on her day off to help me. Steve your awesome too. Keep up the great job. Rhonda the manager has always gone out of her way to help us. We feel very comfortable leaving our motorhome in this well maintained secure facility. Rhonda has been absolutely awesome. Extremely friendly and helpful. I would refer a friend I would rent again. Friendly staff. Great upkeep. Great Security. Clean and Great Safety. Also Great Location. Referred by a friend. I really like storing here. All amenities are provided. friendly staff, website was user friendly, site clean and secure, good location. aware of refer a friend reward 25.00. I would rent again. Pleasent Experience Rhonda was very warming. Good Customer Service. Very friendly and knowledgeable.We were greeted with a smile. Rhonda recommended premier coach works to fix our Rv. It was very conveniently located on the property. Kody from Coach works was very friendly gave us a quote for fixing our Rv. We are very happy, Prices were good and Service excellent . Only down fall was no electric. Steve was very friendly and really went out of his way to make our move in great from communication over the phone to taking the parking space we had reserved. Very Impressed. Very accomodating and friendly. would refer our friends. Rhonda was very knowledgeable and friendly. She stayed late for us to get a uhaul. The property was very clean. Quick responses to my question whether e­mail or phone is most knowledgeable. Would I rent here again? Absolutely! Everyone is always ready to help. Heather is very professional and always their to help and advise. Nice, friendly people, great customer service! Nice to have a one stop shop. Heather was awesome! !Very helpful, stayed late to accommodate me. Told me to be prepared for 20 minutes of paperwork so no surprises. I am a previous customer to the facility. I keep coming back again because it is nice!! Great Service and people will be back again! Agreat place with great prices!! Heather is always pleasant and ready for all my questions! Heather first helped me when she was at the University office. I still have a storage room there. She was excellent as a manager there and is excellent where she is now. Heather is a real asset to your company. She is an outstanding manager. She is very knowledgeable in all she does. Clean,friendly environment......best storage around.....heather is awesome!!!!!!!!! Excellent Facility & Billing Options!! Awesome! Have been here for 7 years!!! I am renting again because I love the customer service of the office staff. Always very kind and helpful. Great Customer Service the person helping me was very knowledgeable and friendly. She had a great personality and was friendly. Thank you. Everything is going good with my storage of my trailer. Staff is very good. The staff here answered all my questions and were very friendly. Thank you!! This is the best clean convenient place to store a RV. It has many conveniences like dump station and refill of water supply & LP gas available. Very Clean and professional staff! I would recommend this storage facility to all of my friends and have done so already. Heather is a pleasure to work with in all aspects of the storage business, there has not been a question/problem that she has not been able to answer or resolve. I would recommend Premier RV & Self Storage to anyone looking for a storage facility as long as Heather is managing the property.